Vote for your favorite BIC lighter design and enter for your chance to win one of 1,798 BIC baseball hats. 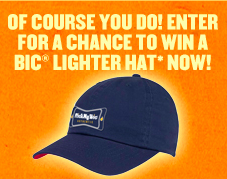 Enter daily, good luck! Each day for the thirty–one (31) days of the Sweepstakes Period, fifty-eight (58) prizes will be available to be awarded, by random drawing from among all eligible entries received. 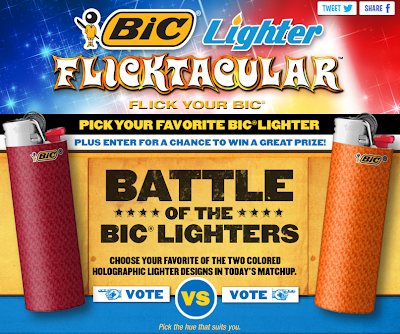 A total of One-thousand, seven-hundred and ninety eight (1,798) prizes will be available to be awarded each consisting of: one (1) BIC® Lighter baseball hat (one size only; color and design may vary). Approximate Retail Value (“ARV”) of each prize: $6.00.